Nothing defines a city like its traffic. I almost typed "tragic" there - a Freudian typo. Brisbane's traffic is well and truly tragic. A swelling population, together with years of neglecting the road system and lacklustre planning in the sphere of public transport have consigned motorists here to interminable delays. There is some action now - better late than never - but that leads to more delays and more frustration in the short term. I came across this photograph from 1963 recently. 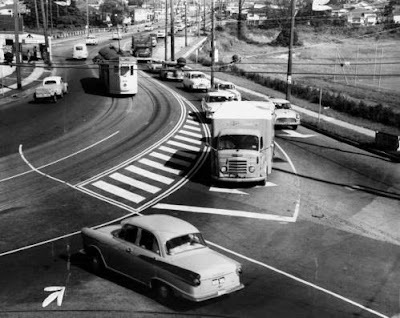 It shows Lutwyche Rd snaking round a bend where Lutwyche becomes Kedron. The field on the right is a TAFE campus, and the outbound tram in the top left is just about to cross Kedron Brook. Fast-forward forty-seven years and you see this. The trams have gone, but traffic is no better - even though motorists are avoiding this area at the moment because of the construction of the Northern Busway, which is the reason for all the cranes visible in the photograph. Brisbane is in a bridge-building and tunnelling frenzy as politicians play catch-up with infrastructure. The area around here has become a nightmare because tunnel drilling machines and lorries work 24/7, creating noise and dust that is driving residents nuts, and road closures that are driving small businesses to bankruptcy. Will it all be worth it? Next: Cleric calls Council "crap"! Hels: If you and I can work it out, why can't the politicians! observer: Not sure how long since you have been here, but I bet you wouldn't recognise it!